Welcome to HorseRaceBetting.org, a beginner’s guide to betting horses. 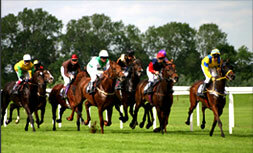 On this website you’ll find information on tracks, horses, wagering options, and where to bet horse racing online. We’ve kept our content simple as our target audience is North American bettors just starting out wagering the sport. We do however have some strategy content as well as pages on UK, Irish, Australian and Canadian races. No matter if you’re looking for a basic overview or a list of betting sites supporting Del Mar Races or another track, you can find this and more here. If you are new to betting on horses it’s probably a good idea to start out learning some of the different horse racing terms that you will see throughout the site. While there are always races available to bet on, there are some very important races that someone interested in horse racing should know about. Some of the races you will learn about on this site are the most important races in horse racing and offer up a much larger betting pool giving you the opportunity to win a lot more money. Almost anyone with even the smallest bit of knowledge in horse racing can tell you the names of a few well known races. The Kentucky Derby, Belmont Stakes and the Preakness make up the US Triple Crown and are 3 of the most well known races in the horse racing world. Some other well known races are Canada’s Queens Plate, the UK Triple Crown and the Melbourne Cup. A key to learning about horse racing is to become familiar with the different types of races that horse racing has to offer. While you may be good at picking winner in Thoroughbred Racing you will realize rather quickly that it differs from betting on Harness Racing. Reading up on the different types of horse racing available will offer you a much broader perspective and will allow you the ability to test out which races you prefer. It will also give you a much better awareness of the diversity within the sport of horse racing.